In these recent few weeks approaching the tenth anniversary of the September 11th attacks on our country, I have seen or heard of a number of discussions focused on where each of us was. Historically, the people of my lifetime asked this question in the context of President Kennedy’s assassination. For the past ten years and perhaps for most people across the globe it has been September 11th. The moment I first heard the reports I was pulling into the drive at work – Jeppesen. “Jepp” is largely an aviation information company. We produced – and I sold, in simplest terms, instrument flying information. Although cockpits are increasingly “going electronic”, Jepps have traditionally been paper. In simplest, layman’s terms, the information would be referenced – and relied upon – as if the crew had no windows, and would rely solely on their instruments and the charts and procedures they had in front of them that told them exactly where to be when. Ironically, at work we might occasionally lament after a tragic air crash somewhere, anywhere in the world, that warranted or not, when there are once again hundreds or thousands of sheets of paper floating all over a hillside that have the name “Jeppesen” printed on them – enroute charts, SIDs (Standard Instrument Departure procedures), STARs (Standard Terminal Arrival Route) charts, and Approach procedures among others, the lawyers have an easy target right there in front of them. In didn’t really matter at the moment if a chart was out of date or not, or had been used properly. Jeppesen’s name was there so the lawsuit would always follow, and blame is shared by almost everyone. I said I was pulling in the drive at the Jeppesen parking lot. More specifically (because it is in these things that we do remember so well) I remember the exact spot I was in: it was the dip in the transition from asphalt to concrete; the transition onto the apron of the parking lot, the edge of the street as my Land Rover crossed the threshold from street to parking lot. There was a dip as the concrete had been formed with a shallow trough in the ever-slightest V shape to serve also as a drainage gutter. It then immediately angled up onto the asphalt as the parking surface was inclined in its entirety from the street across the expanse of eighty yards or so to the far eastern edge of the lot. Needless to say, inside Jeppesen world headquarters everyone was in shock. The TVs had already begun to roll out of the conference rooms; groups of people, large and small were congregating everywhere, and in places people did not usually congregate. The last of the phone calls were ending as I walked into the sales area and with rare exception the phones didn’t ring after that. My supervisor, Tony grabbed me and said, “Let’s go to my car.” We raced back to the parking lot and ran to his car, where we sat, doors open, listening to the evolving tragedy. We could have been inside watching it unfold on the televisions with everyone else, but at least at that moment we didn’t need to. We could see it all as we stared at the dashboard and out the windshield, across the arking lot and up over the hillside and beyond the fence separating the Jeppesen property from Centennial Airport. As we listened and increasingly felt more stunned and angry and determined and fearful, we almost didn’t notice there was no longer any aircraft engine sound coming from across the runway; already – no airplanes were taking off or landing. After perhaps fifteen minutes of listening in our own distant agony we returned to the building and walked quickly to the cafeteria, where we found as many as two-hundred of our co-workers crammed everywhere, all facing the south wall where a single television stood atop a tall stand. Within five minutes of arriving we watched as one of the towers fell. A gasping inhalation filled the room as we all reacted. I don’t remember any words that were spoken, if at all. In my memory it is silent. At home the silence above us continued. The back or west side of our home faced the mountains; from the second floor height of our bedroom window we could see the beautiful contoured greens and browns of the foothills and the “hogback.” Normally airplanes of all kinds, large, small, fast, and slow – those that would loll over the near peaks conducting their training maneuvers in sharp turns, cutting power, increasing power; the high-pitched and throaty Lycoming piston engines singing their straining and compliant songs, commanded by student pilots at the direction of their instructors – flew over. But now only eerie silence and emptiness filled the blue space. In those weeks following, it was only the serious and violent sounds of fighters, F-16s from Buckley Air Force Base, screaming straight west over our house, flying CAP – Combat Air Patrols; practicing to attack something with an angry vengeance approaching over the Rockies; they would quickly reign death on anything that would even think about making a malevolent move on Denver. Ironically, and in a twist that would churn up yet another sad day in our memories, as my wife and I would look west from that window to view the empty sky, so strange, devoid of any airplanes, we were forced to look over and beyond Columbine High School to take in our view of the mountains. Another place where “it” was no accident. Many of those F-16 pilots were friends of mine. I had worked at the 120th Fighter Squadron in the first couple years I was in Denver. I had also traveled to Alaska with them and briefed them daily after the shoot-down of Capt Scott O’Grady in Bosnia. The Serbs had used the Soviet-built SA-6 in an unconventional way, and the result was devastating. Outside the strict bounds of Soviet Surface-to-Air Missile (SAM) engagement doctrine, One system was connected via fiber optic cable to a second SA-6; one operating only as the Shooter, the other providing the Radar for search and track, target acquisition, and fire control. The effect was that the F-16s only “saw” the SA-6 Radar, and did not know of the Shooter several miles away. It nearly proved fatal. But it was the technical and tactical aspects of how the SA-6s were employed that concerned the Redeyes of the 120th, not the human drama. Except that there was a brief flurry accusing O’Grady of ineptitude – one of the pilots had gone to flight school with him and derisively claimed “the guy didn’t know what he was doing anyway.” As is oft times the case, fighter pilots are ready with jokes and quips to cover and deal with the terrifying underlying truth that they could never escape: “It could have been me.” These kept their interest in my daily Technical Intelligence Briefings and situation updates. They were not the only ones I had a close connection with. The Racers of the 113th Fighter Squadron in Terre Haute were my home unit, where I first joined. I retained a keen impression from childhood of the thrill and power of fighter jets when I had gone to air shows with my father in the late 1960s and early ’70s. They were flying F-84s then and later F-100s. I was small when I knew I wanted to be part of it, and as with several of my close friends, joined the Indiana Air National Guard soon after college. And it was with them that I shared my first encounter with the dark, painful side of that life. I had gone to flight school – SUNT, or “Sun T” – Specialized Undergraduate Navigator Training – at Mather AFB in California with my close friend, Andy Baer and it was just five years later that he and another squadron mate and friend Ralph Miller were killed in the crash of their F-4E in the Nevada desert while flying intercepts on September 19th, 1990, training for a war in Iraq we were all sure was coming. But Andy’s and Ralph’s deaths were an accident, and everyone who either flies or lives in that world will eventually know someone who is killed in that dangerous course; it’s part of it. But the killings committed at Columbine High School were no accident, and the terrorist attacks of September 11th were not an accident. And here was another component that added to my broader perspective on what had happened to all of us: a month shy of one year before – October 2000 – I was in Germany to participate in an exercise, Trailblazer 01, just weeks after the bombing of the USS Cole in Yemen. My lifelong friend – also a close friend to Andy and Ralph – Cliff Thomas, was also there. He went as part of a contingent of the Syracuse (New York) Air National Guard unit. We had wanted to travel to Germany together since we were small boys, and now here we were. We spent time with his grandmother and other family members in Oberursel, outside Frankfurt, then drove south and west to Ramstein and Landstuhl for our work. That was the good part. But the sobering part was also there. Barely a month before, the injured – and dead sailors from the terrorist attack against the USS Cole had been brought to Landstuhl Medical Center, just one hundred-some yards from where I was staying. Situated in the deep, beautiful woods above the picturesque town of Landstuhl, the US Army’s Regional Medical Center was where all our casualties from the Middle East and Europe were brought. Most of the injured Cole sailors were still there when Cliff and I arrived, and some of them died there. This past spring, 2011, it was again to Landstuhl that a soldier I had a connection to was taken with life-threatening injuries. My niece was dating a young man Aaron, from Littleton, Colorado whose brother, Daniel – both of whom had attended Columbine High School – was serving with a Marine unit in Afghanistan. While on a dismounted patrol somewhere in the Helmand Province, he stepped on an IED – and Improvised Explosive Device – and when it detonated he lost both legs and a portion of his right hand. After more than two intensive and tenuous months in hospital, Daniel had recovered sufficiently to travel and with his parents at his side, winged his way home. I was privileged and humbled to see Daniel arrive at Denver International Airport to a huge and awe-struck yet cheering crowd of family, friends, television cameras and thankful admirers. Suffice it to say he is a remarkable and inspiring guy. Today, with the help of an amazing family, dedicated friends, and a true-to-their-word US Marine Corps, he is still recovering and well into discovering and developing a new life. Be sure to take a few minutes to visit his blog at danielcwriley.blogspot.com. The month before had been the USS Cole attack and during the same period my friends in the Colorado fighter squadron were leaving Incirlik, Turkey, having completed their latest turn flying the Northern No Fly Zone in Iraq and were being replaced by my former squadron mates and friends of the Terre Haute unit. All these people I knew, from such far-flung places and this place I was in now in the midst of world events – it all seemed in some way to be centering here. The total experience was powerful and acute, as though I was staring into the convergence of globally significant events with a personal connection to it all. The personal intensity was compounded, too because my wife was home and very pregnant with our son, Jace and our sixth anniversary passed during my time away. It was not the best time to volunteer for an exercise overseas, but it was nothing compared to what so many others had committed to. (I had roses sent to her to deliver at work – I thought quite a feat to pull off from half way across the world.) The experience manifest itself in a peculiar emotion that, even now, when I think of my time there, generates a unique feeling reserved for that time and place. Beginning in early August 2001 I started a nearly month-long conversation with a pilot of Middle Eastern origin flying a business jet out of Nashville, Tennessee. I was assisting him with plans for a Nashville-to-Saudi Arabia trip to be made sometime in September. He required what I considered to be standard materials – a trip kit – a one-time purchase – guaranteed to be current (legal) for a relatively short period of time, say, 14 days. He needed this because he was not a regular subscriber to “Jepps”. He would also require electronic NavData for his GPS – Global Positioning System. The trip kit would be in paper, and would be quite a stack: Every “plate” and chart for the Eastern United States, Eastern Canada, crossing the Atlantic, Western Europe, and finally the Middle East. His NavData would consist of two separate data cards each of which looked like a super-thick plain, black credit card with gold contacts on one end. Then add in the flight planning software. Pretty expensive package, all told; say, four-to-five figures – in the low-several thousands of dollars. This in itself was somewhat odd in that virtually every business jet on the planet requires Jeppesen procedures, whether paper or electronic, and Jeppesen electronic NavData for their on-board navigation systems. Jeppesen is (or at least at that time was) the only producer of such information and electronic data on a world-wide scale. If someone is to fly globally, they have to use Jeppesen. My memory of all the fine details of this event is not as clear as it was ten years ago; I think my conclusion must have been that this was a newly-acquired aircraft and perhaps flying “home” so did not yet require any subscriptions. A trip kit would suffice. So our conversations continued. We spoke regularly – two to three times each week. Eventually, what became the most outstanding aspect of those conversations was the thing that led to a standstill: money. Normally – routinely – Jepp takes this type call all day long, every day. These people pay right now. If they can afford this aircraft, or if their company deems it necessary to have it, they can pay, and they do. The people who fly on a company aircraft from Seattle to a meeting in Minneapolis or from Teterboro to London, or the guy who flies a family-owned G-4 to the Kamchatka Peninsula to go salmon fishing, or the small but very hard-working, very successful factory owner – say, a foundry or electronic components, or wiring harnesses, or industrial hydraulic pumps – and he’s from Casey, Illinois. He owns a Lear 25 because it’s what’s needed and not because it’s fun – and flies from Bloomington to Columbus to Little Rock to Dayton and back home all in two days – they all have established themselves financially enough to pay for their flying. But not my guy. I’ll call him “Faruq.” What first stood out about him was how exceptionally polite and articulate he was. Not that he got the Queen’s English exactly right. Lord knows that we Hoosiers rarely do that. He had his grammatical foibles, but he handled his English a lot better than I would have handled my Arabic. But it was his presentation that stood out more than anything. And it developed into an upward spiral. The more polite and appreciative he was, the more I enjoyed speaking with him and helping, then, in return, the more pleasant he continued to be. And so it went. But somewhere after our second or third conversation, the calls began to end with projections and anticipations of when and precisely how payment would be wired or a company credit card would be provided. The plans were clearly stalling for want of “show me the money”. In the almost daily calls to come now, Faruq became very apologetic and began searching me for alternative ways to get the materials shipped on time; he had a hard deadline he had to meet. He would say, “We’ve got to go by.…” or “The boss needs to depart no later than….” And he became more and more animated in his expressions over the phone, making it clear this was extremely important and he was becoming desperate, caught in the middle. But invariably we would end up rehashing the fact that I could not ship anything without full payment. It was then that again he would apologize profusely and assure me he was doing everything he could to arrange payment but it was difficult. It was clear to me that moving payment from “Saudi to here” would continue to be fraught with snags. Credit cards couldn’t do it. Cash converted to a cashier’s check couldn’t either. Neither could a wire. So the order never went. Our last phone conversation was sometime during the week of September 3-7; I do not recall exactly which day. Faruq expressed the slightest bit of hope that a wire transfer could be made, but he also spoke with what stood out to me as an undertone of resignation, as if he knew the trip he needed to take so badly – or the trip he was under such pressure to complete – would not take place. He was friendly and polite all the while. Over the weekend, as he occurred to me only as an after-thought, I expected to hear from him Monday, September 10th, but didn’t. They named him precisely. And it went from there: A pilot based in Nashville… disappeared days after the attacks… no trace… one of many suspects… unaccounted for… wanted for questioning… the 20th hijacker… others not yet identified… …and on and on. The FBI Special Agent-in-Charge who came to Jeppesen to interview me turned out to be a friend and former colleague of mine. In the first year I lived in Denver and while I attended graduate school, I worked an assignment (I was an Air Force Reserve intelligence officer) for the FBI as an intelligence analyst with the Metro Gang Task Force, doing our small part to combat the drug war as it came into the Denver suburbs from California and Mexico. “Rich” was now working in a different division, still in the Denver office, but had clearly performed well and had built on his already high reputation. He was now in white collar crime but was asked to head up the Denver-area investigation in this global terrorism case. We had not seen each other since the spring of 1995 and it was a bitter-sweet reunion. Because I had an active security clearance, he and I were eventually able to discuss things on a level that most others in my position could not. That I happened to be in sales at Jeppesen, knew Rich, and had a clearance was altogether coincidental but fortuitous. It was agreed that I would, for a few days, be off my normal sales work at Jeppesen and would put my analyst skills to work on reviewing records, conducting link-analysis and try to come up with some useful conclusions with the advantages of both my previous experience and my knowledge and understanding of Jeppesen database tools. In the end, Faruq was deemed to be by all accounts innocent – at least in a direct sense. As far as the Authorities could determine, he was as so many during those terrible, tragic, and chaotic days. It looked bad for him, but apparently he was simply just in the wrong place at the wrong time. It was reported many weeks later and repeatedly in a type of “where are they now?” report that spanned the national new media outlets in various versions. In all likelihood, he did what many did – he fled the country as fast as he could, not wanting to take a chance at getting caught up in something he was not part of in the first place. I do not know how he did it. As for me, I have to admit I still harbor my doubts about him. It was all too close as far as I was concerned, too coincidental to be unrelated. I remain uncertain either way now, and cannot quite say exactly what I believe is true about him. But he is gone now, by all accounts, and that day is past. But not ever completely. In these intervening ten years I have realized I am quite alone it seems, in my perspective on the term “9-11”. This realization was furthered this week when my wife and I watched a wonderfully produced and powerful special program by Fox News, Freedom Rising which attempts to encompass September 11th in its entirety, its centerpiece being the rebuilding in New York. I found that there are many names now, including the “9/11 Foundation” and the “9/11 Memorial”. The general reference “9/11” has been commonly adopted and is essentially universal. So, ten years later I find myself not quite as militant in my rejection of the term. But what results for me is the awareness of a slight sense of disappointment in myself because of it. I know that so much of that is – and was – driven by how I felt at the time, and for the most part I have not changed in that regard. And so they do, ten years after. The essay that follows was originally published here in 2009. 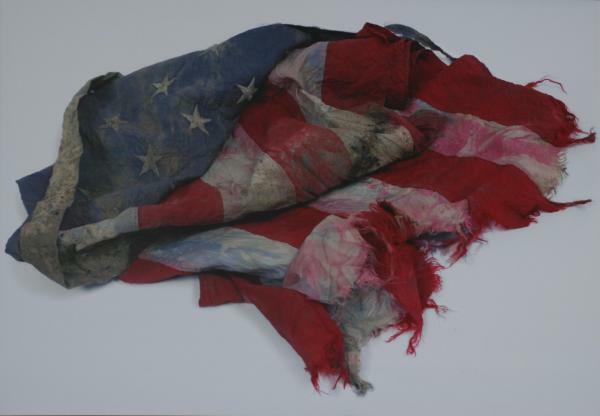 The flag depicted was recovered from the World Trade Center site and photographed by Rob Hans. – – – Michael Conner is a Systems Engineer and Watch Officer at the Missile Defense Agency in Colorado Springs, Colorado. He is a retired US Air Force Intelligence Analyst and Space and Missile Operations Officer. Culminating a career of 23 years as a Guardsman and Reservist at the rank of Major, he most recently served as a Crew Commander with Headquarters, Air Force Space Command at Peterson AFB in Colorado Springs. He has worked in the aviation industry as a civilian, and holds a Masters Degree in Public Administration from the University of Colorado at Denver. Conner is also a writer. In addition to serving as founder, publisher, and writer at Ask a Hoosier.com, he has also written a children’s picture book (still seeking publication) and has started writing a young boy’s adventure book as a well as a novel. He is originally from Terre Haute Indiana and is a graduate of Indiana State University.